Determining cultural fit is just as important as determining skill set. Regardless of how much experience someone has, it can be disastrous if they do not fit in well with the company culture. 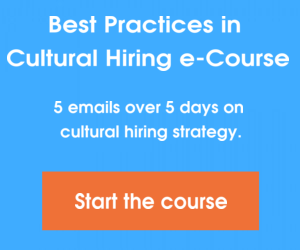 Interviewing for cultural fit is a little different than interviewing for skill. There are certain things you must look for in a candidate’s past work history as well as certain questions you must ask in order to determine what culture the candidate performs best in. Look at the companies the candidate has been employed with in the past. If they have only worked in large, corporate structured companies, they may have a difficult time adjusting to a smaller, startup environment and vice versa. Larger corporations typically operate quite differently from smaller companies. Often, you will find more structured processes and procedures in larger companies, whereas you may find more of a fast-paced, solutions-oriented environment in smaller startups. It’s important, depending on the environment you are hiring for, that you asses whether it will be the right environment for the candidate. Be sure you are asking the candidate questions surrounding their previous jobs, roles and responsibilities, as well as what their day to day looked like. Did they work from home with little to no interaction with co-workers? If so, a close-knit, team oriented environment may not be the best cultural fit. A person who is used to working alone for many years may have difficulty adjusting to a team oriented work environment and relying on teamwork to complete tasks. Likewise, someone who has only ever worked in team environments may not perform well in a position which requires little to no interaction with a team. Always make sure you are asking questions during the interview process that will help you understand what the candidate prefers in a work environment. What type of work environment do you enjoy? Startup or corporate environment? Why? Do you prefer to work in a team or alone? Why? What did you enjoy most in your previous positions? Why? What did you enjoy least in your previous positions? Why? Pay attention to the candidate’s responses and think about how it relates to the culture you are hiring for. Profile or personality assessments can help you to understand the candidate’s motivations as well as the type of situations and environments they perform best in. You should never base a hiring decision solely on these assessments, but use them to further assess each candidate based on previous interviews and interactions, as well as any additional questioning and assessment. Interviewing for cultural fit takes a little more digging than interviewing solely for skill. However, it can be less difficult when you take time to focus on these four interviewing strategies. What are ways you assess cultural fit during the interview process? Please share your tips in the comments below.